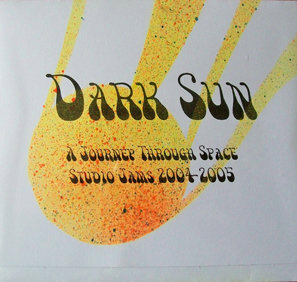 Dark Sun- "A Journey through Space"
The Finnish space rock band has a new release of archive jams from the studio sessions that they had in 2004 and 2005. This is some really cool and psychedelic stuff and pressed in only 80 copies on CD-R so hurry. There are 7 jams in 52 mins and it all starts off with Set the Master of the Dark Sun Universe, which is a bit of a jam take on Set the Controls for the Heart of the Sun, in a very loose way. It is really psychedelic and turns into Hawkwind’s Master of the Universe at the end! Electric Sunshine is a laid back and spacey track, after the hard rocking psychedelic track before. It features a really nice guitar solo. Venusian Dream Sequence is very nice track with some really dreamy guitar. A journey through Space brings back some more heavy space guitar as this one slowly builds up and some great duelling psych guitar solos. Return to the Controls brings us back to another part of the Set the Controls jam for another 4 mins. Hope Turns into Fear is one of the few tracks with keyboards, which means that Janne and Mikko showed up. Janne does some spontaneous psyched out stuff. Celestial Waves ends this cool CD-R with a laid back spacey instrumental track. It is all instrumental except for the Hope turns to Fear. Great band.